CHRISTMAS is in the air again. And that means it’s time for the cherished Narre Warren North Community Carols, co-ordinated by stalwart Bert Rae, to once again capture the hearts and minds of Casey residents. 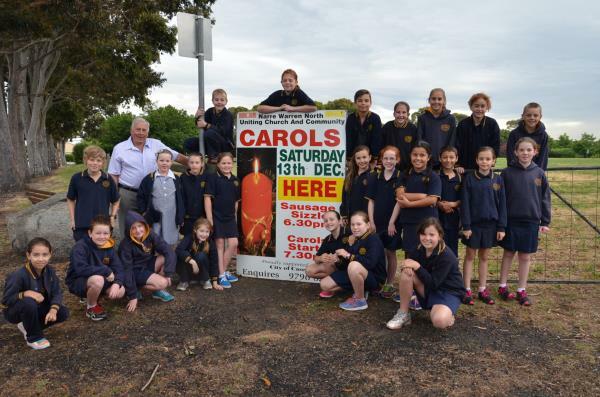 The Narre Warren North Primary School choir will be treating guests to an evening of carols on Saturday 13 December at A’Beckett Road Reserve. Twelve-year-old Oliver from Berwick will also be singing solo for the second year running. Oliver is a member of the National Boys Choir and plans to sing three carols on the night. His mother, Caroline Thomson, said Oliver was honoured to be asked back to the Narre Warren North carols. “He’s coming in as a separate singer. He’s performed in various plays before and Bert asked if he’ll come back again this year,” she said. “We met Bert through Casey councillor Wayne Smith. “We were at a photo shoot for the arts and Wayne introduced us to Bert and said ’you should get Oliver at one of your carols’. Ms Thomson said she couldn’t wait to see her son on the carols stage again, and looked forward to a lovely evening in front of the choir. “Oliver loves it, he loves performing – whether it’s film, or TV or singing. He loves the whole performing arts,” she said. “And he loves the whole build-up to Christmas, kids love Christmas and Oliver loves being able to make people happy and singing. “From a parent’s point of view I’m very proud of him and he’s very passionate about it. The Narre Warren North Community Carols will run from 5pm to 10pm. For more information, phone 9796 8215.